Maine Is Trying Out A New Way To Run Elections. But Will It Survive The Night? The man who lives in the Blaine House in Augusta, Maine, was, for many, a sneak preview of the 45th president of the United States. Like Donald Trump, Republican Gov. Paul LePage has transformed the face of government with his politically incorrect brand of conservatism — and he did it despite winning less than a majority of votes. LePage won a seven-way Republican primary for governor in 2010 with 37 percent of the vote, and he beat a Democrat and three independents in the general with just 38 percent. Eight years later, it’s far from clear that LePage would have a path to victory if he were running now in the Republican primary for governor. That’s because, partly in response to LePage’s plurality wins, Maine on Tuesday will become the first state to use ranked-choice voting to decide a statewide election. So not only are there races in Maine we’ll be watching, but the process matters too. And if Maine voters don’t pass an initiative reauthorizing the voting method at the same time, this real-life political-science experiment will be cut short. Most elections in the U.S. are what we call “first past the post” — that is, you vote for one person, and the candidate with the most votes wins, even if it’s not with a majority. Not so with ranked-choice voting, also called instant-runoff or preferential voting. In races with more than two candidates,1 Maine’s new ballots ask voters to rank candidates from their first to last choice. If no candidate receives a majority of first-place votes, the candidate with the fewest first-place votes is eliminated, and his or her supporters are redistributed among the remaining candidates based on whom they ranked second. If still no candidate has a majority, the candidate with the next-fewest first-place votes is eliminated, and so on until someone wins 50 percent plus one vote. This procedure ensures that no candidate opposed by a majority of voters wins anyway thanks to a fractured opposition, and it also makes it much safer to vote for a minor candidate without worrying that he or she will play spoiler. 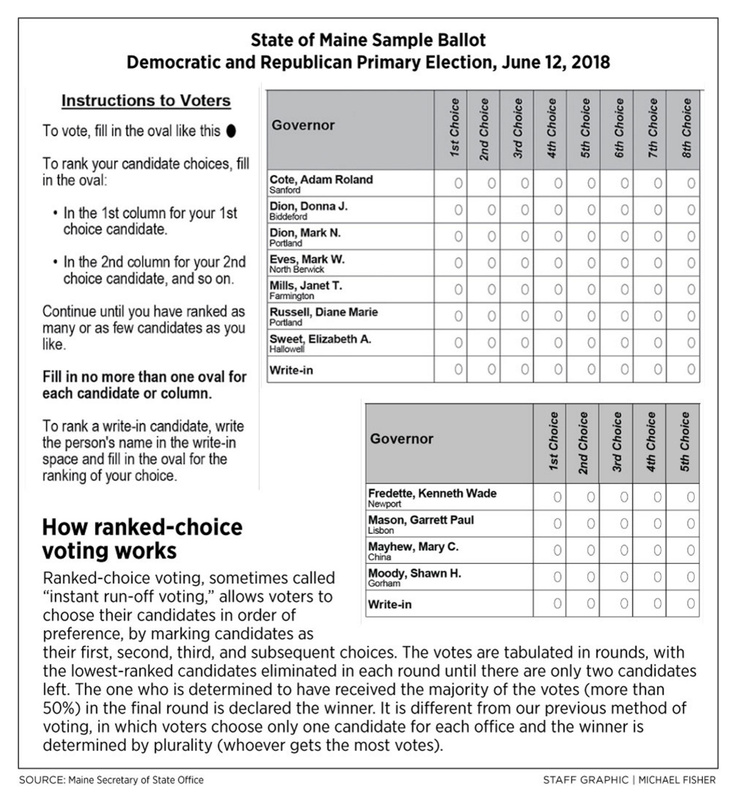 However, some research has shown that ranked-choice voting can depress turnout by making voting more complicated; indeed, Maine election officials are bracing for a surge in questions from voters unfamiliar with how to fill out the new ballots (which look like a grid). The secretary of state has also tried to combat voter confusion with posters hung in polling places, an animated video explaining how ranked-choice voting works and a web page of ranked-choice voting resources. The stakes of implementation are high: If Maine’s experience with ranked-choice voting is seen as a failure, it could hinder the campaign to expand ranked-choice voting even further. So far, anecdotal evidence is mixed on how well poll workers are prepared to sail these uncharted waters. For all that trouble, ranked-choice voting will only be necessary Tuesday in four races,2 including the Democratic primary for Maine’s 2nd Congressional District. Democrats will need a nominee with considerable blue-collar appeal to defeat Republican Rep. Bruce Poliquin in this rural district that voted for Barack Obama by 9 percentage points in 2012 but Trump by 10 points in 2016. The primary is a close race between state Rep. Jared Golden and Lucas St. Clair, the heir to the Burt’s Bees fortune who led the successful but controversial effort to establish Katahdin Woods and Waters National Monument in the district.3 Former Islesboro Selectman Craig Olson is also in the mix, especially since ranked-choice voting allows people to vote for him without fear that they are throwing their vote away. But the race exposes the limitations of ranked-choice voting to boost minor candidates: All indications4 are that Golden and St. Clair are far ahead, and in a recent debate, they spent more time squabbling over a pro-St. Clair dark-money group than cozying up to Olson in an effort to win his supporters’ second-place votes. If ranked-choice voting hasn’t had a significant effect on campaigning in the 2nd District, perhaps a better test is the free-for-all for Maine governor. Seven Democrats and four Republicans are running for the open seat, so it’s very likely that multiple rounds will be needed to decide the winners. The Republicans have had a hard time distinguishing themselves: Businessman Shawn Moody has inherited many of LePage’s supporters, but he joined the GOP only in 2017 and, along with state Senate Majority Leader Garrett Mason, is seen as mellower than LePage. By contrast, former LePage Cabinet member Mary Mayhew and House Republican Leader Ken Fredette are known for fiercely carrying out the governor’s agenda, although Fredette’s campaign has raised very little money. In a ranked-choice poll of the race by SurveyUSA, Fredette and Mason were eliminated first, and Moody beat Mayhew in the final round. The Democratic fault lines are easier to trace: Attorney General Janet Mills, a centrist and the only candidate from the 2nd Congressional District, would likely be the favorite under a normal plurality system because progressives and 1st District residents would be split among her opponents. But progressives are hoping ranked-choice voting will help defeat her. In an unusual alliance, the race’s two most prominent progressives, former state House Speaker Mark Eves and lobbyist Betsy Sweet, have publicly joined forces, with a video and canvassing campaign urging their supporters to rank the other one second. Meanwhile, the race’s best-funded candidate, veteran and renewable-energy entrepreneur Adam Cote, is a moderate with a progressive streak on guns and the environment. In the SurveyUSA poll, Mills defeated Eves in the fifth round. The primary has undermined one argument in favor of ranked-choice voting: that it discourages negative campaigning. The Mills and Cote campaigns have exchanged harsh words, while Moody has been attacked by his GOP rivals in ads. Ranked-choice voting may encourage campaigns to play nice with minor candidates whose support they aspire to inherit, but the instant runoffs usually come down to a head-to-head. Campaigns still have an incentive to tear down the front-runner in a race, especially if he or she is poised to capture a majority in the first round, because his or her supporters will never be redistributed. So maybe ranked-choice voting, in its maiden statewide voyage, hasn’t changed much on the campaign trail. But the real test isn’t until after the votes are counted, which, for races that require instant runoffs, won’t be until at least June 18. Only then will we know if ranked-choice voting produced a more consensus winner — or if it affected the outcome at all. That’s bad timing for Maine voters, since the final statewide election they are voting in on Tuesday is a referendum, Question 1, on whether to keep ranked-choice voting. Maine approved ranked-choice voting in a 2016 ballot initiative, but in May 2017, the Maine Supreme Judicial Court said in a unanimous advisory opinion that it was unconstitutional in gubernatorial and legislative general elections (although not for federal elections or any primaries). In response, the legislature in October effectively repealed5 the ballot measure for all Maine elections, inspiring a new ballot initiative to repeal the repeal. When that referendum was approved for the June 12 ballot as Question 1, it also had the effect of reinstating ranked-choice voting until voters decide its permanent fate. The language of the ballot measure has confused some voters, but basically, a “yes” vote on Question 1 means that Maine will continue to use ranked-choice voting in federal, but not state, general elections in November and beyond. There’s been no public polling of Question 1,6 but the fact that the referendum is being held on primary day may help it pass. In 2016, support for ranked-choice voting split along partisan lines, with Democrats strongly in favor and Republicans strongly opposed. That’s good news for the “Yes on 1” campaign, since Democratic turnout has consistently been up in primaries so far this cycle, and Maine has more Democrats than Republicans overall. Supporters of Question 1 have also invested $1.3 million in the campaign to keep ranked-choice voting, while no committees opposing Question 1 have reported raising any money at all. That said, the Maine Republican Party has reportedly been organizing an anti-Question 1 campaign alongside its other efforts. And, at the end of the day, Mainers are in the unusual position of voting to change a system that they are actively confronting as they cast their ballots; it’s easy to imagine that the experience of using ranked-choice voting will change many people’s minds at the last minute. CORRECTION (June 12, 2018, 10:28 a.m.): A previous version of this article misspelled the town of Islesboro as Isleboro. If there are only two candidates, ranked-choice voting is unnecessary, since one candidate is guaranteed to get a majority in the first round. Aside from the races we explore here, it will also be deployed in the Republican primary in House District 75. Because of that, Golden, a Marine veteran who used to work for Republican Sen. Susan Collins, is probably the stronger general election candidate. The measure was technically delayed until 2021, at which point it would be repealed if the state constitution had not yet been amended to allow it. Maine voted 52 percent to 48 percent to implement ranked-choice voting in the first place. But that was a year and a half ago, and the system isn’t just a theory anymore.